It never occurred to me that I wouldn't tie my own flies. I like to make things and I'm cheap. I immediately realized that a Killer Bugger lost to a snag was much less painful than a four dollar streamer from the fly shop. 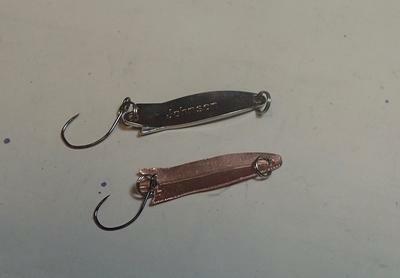 Enter the .4 gram Vega fly spoons, so cool, so small, so rare. I had to make some. The materials are .016" copper and brass from a hobby shop, size 1 split rings from Bass Pro and C'ultiva SBL-35 #8 hooks from Finesse-Fishing.com. I traced the pattern from the Vega spoons, cut it out with shears and cleaned up the edges with a file. After drilling 1/16th" holes I formed the curved shape with the small end of a tack hammer over a curved hollow cut into a block of wood. The shape was completed at about the same time work hardening began to set in. I was prepared to anneal the copper but did not need to. The steepest learning curve of the whole process was inserting the Size 1 split rings with needle nose pliers. I copied the side view curves from the Vegas and the action appears to be similar. I used two split rings because I was concerned that the drilled hole would have a sharp edge that might cut the line. The Vegas appear to have smooth stamped holes. I don't have a small digital scale and my fingers aren't calibrated to .1 grams, but my spoons feel about the same and cast the same. The brass is denser and the extra mass can be felt compared to the copper but it is not clunky to cast. All fishing has been done with the Tenkarabum 40. Polishing, painting and a clear coat are options but as of now I just went fishing, they work. I took them to the fly club meeting last night. Everybody thought they were cool and then started talking about the old days. (for a tutorial search for copper leaf ear rings on YouTube). Only Chris Stewart would publish an article that may cut into his sales! Alan. Awesome work. If you have a Dremel you can clean up the holes. I may have to give it a try. I know I am more cautious tossing a 6 dollar spoon at potential snag laden holes than I would be with a homemade lure. Les - DIY lure making will take a piece of the pie, but more people talking about fishing with spoons will increase the size of pie! 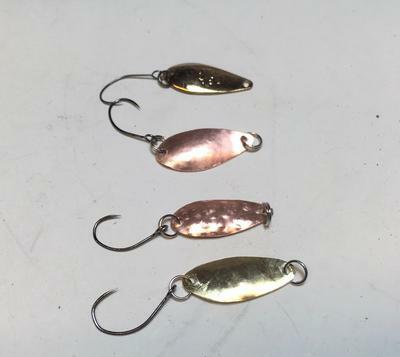 Also, the Cultiva hooks are great choices for home made lures. It's all good. My hat's off to you Alan. DIY projects rule! I'm probably going to show my ignorance here, but is line twist more of a problem with the spoons? (That's assuming that the tenkara/keiryu rod doesn't have a swivel lillian.) If so, how do you remedy that? No doubt, this question has been answered elsewhere, but I'm drawing a blank right now since I don't think that attaching a heavy swivel is something we'd want to do. John, spoons cause much less line twist than spinners, and if you adjust the speed of your retrieve to match the action of that particular spoon they cause no line twist at all. While a spinner blade spins around the shaft, the whole lure spins also. Plus a spinner spins in the same direction for the entire return. That generates quite a bit of line twist. A spoon on the other hand, will spin for a bit, then wobble, then spin for a bit in the other direction. By spinning in opposite directions, the net effect is little or no line twist. However, a steady retrieve that is too fast will cause the spoon to spin in only one direction. Vary the speed and give little twitches. Each twitch will stop the spin and start the wobble. For those who want to fish spinners, or who retrieve a spoon too fast and get some line twist, I now have Owner Micro Snap Swivels on the www.finesse-fishing.com site. As a reminder, your name is not optional when submitting a comment. 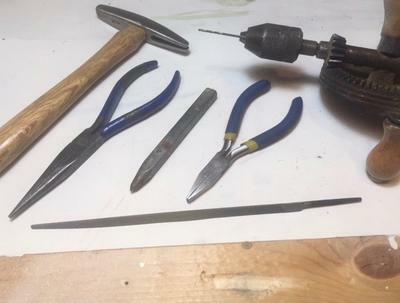 Another nice set of tools to use is a set of jeweler’s files. I have used them for fine finishing on metal. The come in all shapes and sizes. I hope you’ll bring some of the spoons with you when we fish in Oklahoma. Nice job!! I did a similar experiment by hammering a few dimes and pennies on a wood block with a dent in it. They work awesomely. I have a few Luhr-Jensen Kokanee King trolling spoons left over from days of living in Idaho. They are VERY light as they are meant to be trolled behind some sort of weight (in-line or downrigger.) They also have a very small spinner blade on the split ring holding the single hook. 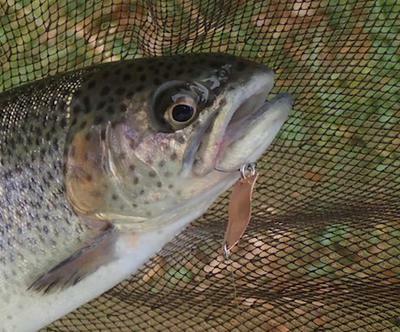 I hadn't thought to try them with a tenkara rod, but I will now! I also think they could be very easily DIY copied.